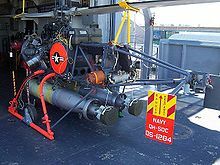 The Gyrodyne QH-50 DASH (Drone Anti-Submarine Helicopter) is a small, drone helicopter built by Gyrodyne Company of America for use as a long-range anti-submarine weapon on ships that would otherwise be too small to operate a full-sized helicopter. It remained in production until 1969. Several are still used today for various land-based roles. DASH was a major part of the United States Navy’s Fleet Rehabilitation and Modernization (FRAM) program of the late 1950s. FRAM was started because the Soviet Union was building submarines faster than the U.S. could build anti-submarine frigates. Instead of building frigates, the FRAM upgrade series allowed the U.S. to rapidly catch up by converting older ships that were otherwise less useful in modern naval combat. The navy was able to inexpensively upgrade the sonar on World War II-era destroyers, but needed a stand-off weapon to attack out to the edge of the sonar’s range. The old destroyers had little room for add-ons like a full flight deck. The original DASH concept was a light drone helicopter that could release a nuclear depth charge or torpedoes. The aircraft was considered expendable. The manned Gyrodyne Rotorcycle program of the mid-1950s provided prototype work for the DASH, and ultimately the Rotorcycle was modified to produce the initial drone version, the DSN-1/QH-50A The DSN-1 was powered by a Porsche YO-95-6 72 hp piston engine and carried one Mark 43 homing torpedo. The next developmental version was the DSN-2/QH-50B that was powered by two Porsche YO-95-6 engines and also carried a single Mk 43. Serial production of the DASH began with the third version, the DSN-3/QH-50C, in which a 255 hp (190 kW) Boeing T50-4 turboshaft engine replaced the piston engine and the payload was increased to two Mark 44 torpedoes. A total of 378 QH-50Cs were produced before production ended in January 1966. A single QH-50A, (DS-1006), was re-activated after contractor testing to test the tilt-float landing gear. A long cylindrical float was added to each corner of the extended skid framework. Each float could rotate 90° from horizontal, oriented to straight ahead, and incorporated a pad at the end for landing on hard surfaces. For landing on water the floats were rotated to the vertical position and the helicopter settled until the floats were approximately 75% submerged. DASH’s control scheme had two controllers, one on the flight deck, and another in the combat information center. The flight-deck controller would handle take-off and landing. The controller in the Combat Information Center (CIC) would fly DASH to the target’s location and release weapons using semiautomated controls and radar. The CIC controller could not see the aircraft or its altitude and occasionally lost operational control or situational awareness. Late in the program, there were successful experiments to add a television camera to the drone. These DASH SNOOPYs were also used as airborne spotters for naval gunfire. A tethered landing system was developed to land and take off in up to Force-6 seas. This system consisted of steel rails which were screwed to the flight deck and a cable system to pull the helicopter out of the hangar bay. The helicopter was attached to the steel rails so that it would not slide off the flight deck in heavy seas. This system was occasionally set up and used aboard ship, but never used in rough seas to launch a helicopter. 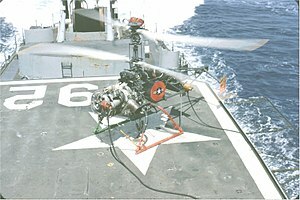 DASH came about because Gyrodyne had worked with the United States Marine Corps to develop a small, experimental co-axial helicopter, the RON Rotorcycle, for use as a scouting platform. A co-axial helicopter has two main rotors spinning in opposite directions to control torque, unlike the more common main rotor/tail rotor found on most helicopters. Co-axial rotors put more power into lift, allowing shorter rotor blades. Both traits help a helicopter to be as small as possible. On the downside, the blades must be kept very far from each other to avoid colliding, since the blades flex as they rotate. This leads to increased complexity and decreased maneuverability. For a drone, these trade offs were fine. For the DASH role, the original marine version had a turboshaft engine for improved performance, and the replacement of the seats and controls with a remote-control system and stowage for two Mk.44 torpedoes. In this form the DASH could be flown up to 22 miles (35 km) from the ship, giving a submarine no warning that it was under attack, at least until the torpedo entered the water. Since it was expendable, DASH used off-the-shelf industrial electronics with no back-ups. The controls were multi-channel analog FM. Over 80% of operational aircraft losses were traced to single-point failures of the electronics. A total of 10% of the losses were from pilot errors, and only 10% of the losses were from engine or airframe failures. As of 2006, a small number of DASH drones were still in operation at White Sands test range, where they were used to tow targets and calibrate radars and electronic systems. The Japanese Maritime Self-Defense Force (JMSDF) operated a fleet of 20 QH-50 drones, for use on its Takatsuki-class and Minegumo-class destroyers. With the difficulty of maintaining DASH operations after the termination of the U.S. program, the drones and associated equipment were removed from JMSDF service in 1977. U.S. Navy designation for nine pre-production aircraft, redesignated QH-50A in 1962. U.S. Navy designation for three pre-production aircraft, redesignated QH-50B in 1962. U.S. Navy designation for 373 production aircraft, redesignated QH-50C in 1962. DSN-1 redesignated in 1962, nine pre-production aircraft for evaluation, with a 72 hp (54 kW) Porsche flat-four piston engine. DSN-2 redesignated in 1962, three pre-production aircraft powered by two 86 hp (64.5 kW) Porsche flat-four piston engines. DSN-3 redesignated in 1962, production aircraft powered by a 300 shp (225 kW) Boeing T50-8A turboshaft engine, 373 built. production aircraft with a larger 365 shp (272 kW) Boeing T50-12 turboshaft engine, fibreglass rotor blades and increased fuel capacity, 377 built. There were 10 modified QH-50D manufactured (Serial number 150AO- 160AO). The “DM” 550shp was supplied by a modified version of the Boeing T50-12. These were used for military reconnaissance for the United States Army during the Vietnam War on 26 September 1959 to 30 April 1975. Three QH-50D aircraft modified with Allison T63-A-5A engines. Proposed production version of YQH-50E, not built. Proposed twin-engine version of QH-50F with larger fuselage and rotors, not built.